The main type of bar stool used by most restaurants and bars is the swivel bar stool. Swivels have been used to attach bar stool seats to frames for many years. People like to move around when they are sitting on a bar stool. The swivel allows the seat to revolve which gives the patron added comfort. We all know that it is important to keep your drinking crowd comfortable enough to have another. The swivel bar stools sold at BarstoolsandChairs.com are commercial swivel bar stools. 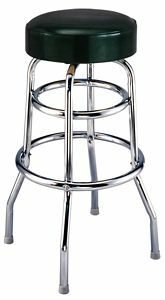 It is important to use commercial swivel bar stools when putting a metal bar stool in a restaurant setting. Commercial swivel bar stools are built to last under the heavy use of bar patrons. No user responded in " Swivel Barstools | Swivel Stools | Swivel Restaurant Bar Stools "